Two 16-Foot Industrial HVLS Fans at Blue Ox® a Much Better Solution Than 30-Plus Energy-Consuming Bucket Fans. Three tenets that Pender, Neb.-based Blue Ox® lives by every day include supporting local parts suppliers, investing in American-made products, and relying on a “less is more” approach to one very important area of its business. Blue Ox, a division of Automatic Equipment Manufacturing, is a fourth-generation family-owned manufacturer of automatic grain mills for the agriculture industry. Automatic Equipment Manufacturing entered the recreational towing business in the 1980s. Further diversification led the company to begin manufacturing car dollies and motor home tow bars, base plates, and fifth wheels. In the early 1990s, the company acquired two businesses, Blue Ox and Duncan Towing. That began the company’s journey toward building a solid reputation as the premier manufacturer in the aftermarket towing industry. Blue Ox has since expanded its product offerings from tow bars to weight-distribution and gooseneck hitches, to carriers for pickups and motorhomes. Blue Ox operates at 40,000-square-feet combination shipping warehouse and assembly facility in Lincoln, Neb. There, products are sent out to the company’s distributors and dealers across the U.S. The facility also houses small product package assembly for dealer shelves as well as the Blue Ox engineering and marketing teams. Generate widespread air movement and relief from stagnant, humid air throughout a combination 40,000-square-foot shipping warehouse. Two strategically placed Entrematic I-Class™ 16-foot diameter industrial HVLS fans operated via Entrematic’s digital touch-screen remote. Much more comfortable working conditions for employees with only two fans running at 60% capacity instead of 30 bucket fans. Watch the Blue Ox Customer Story. To keep employees productive, comfortable and prevent heat exhaustion—especially during the summer months when temperatures often exceed 100 degrees F—Blue Ox installed two 16-foot diameter Entrematic I-Class™ industrial HVLS fans in the shipping area of its warehouse. The fans run all year round, 24 hours a day, five days a week. Interestingly, Blue Ox’s new Entrematic fans weren’t the company’s first experience with an HVLS fan. Blue Ox was already running a fan from another manufacturer in the company’s assembly area. This is now a perfect demonstration set up for IC Energy Solutions, the local company who installed Blue Ox’s Entrematic fans. “When you stand directly under the other manufacturer’s fan, you can feel airflow, but once you move five to 10 feet away from the fan, you no longer feel any airflow,” added Robb Lierman, General Manager, IC Energy Solutions. Blue Ox worked with IC Energy Solutions on a lighting project several years ago. Choquette said that when the time came to install their HVLS fans, it was only natural to depend on IC Energy Solutions who then recommended Entrematic. Choquette explained that the air flow from the Entrematic fans spreads out much farther. He also shared that Blue Ox runs the Entrematic fans about 60 percent of their capacity, while the company has to run the fan in its assembly area at 100 percent. With mornings being cooler during the summer, Blue Ox’s fans also help to keep that cool air circulating throughout the facility. That also helps to maintain a comfortable working environment throughout the day. Conversely, during cold winter months, Choquette said Blue Ox runs eight propane gas-fired radiant heaters. The fans help push warm air near the ceiling down to the employees where it’s needed most. He added that before the fans were installed, the heaters ran constantly and that the work areas never really warmed up enough. Blue Ox clearly needed a solution to help destratify the air. Choquette, who’s an engineer by trade, said he’s impressed with the design and engineering that goes into Entrematic’s fans. He’s also intrigued by how they not only push the air down but far out beyond the fan blade winglets. In fact, he shared that Blue Ox employees often comment on the difference in performance between the two Entrematic fans and the other manufacturer’s fan. “The companies we install fans for are really motivated by performance,” explained Lierman. “That works extremely well for us because Entrematic’s fans definitely are high performance and have the best warranty in the industry.” Lierman added that Blue Ox was originally quoted up to 35 bucket fans from another vendor to help destratify their air. However, when his company recommended installing only two industrial HVLS fans, Blue Ox did not hesitate with its decision. 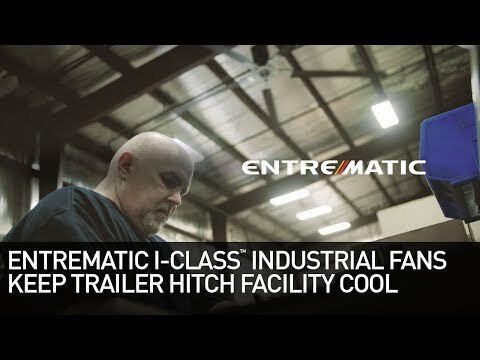 For more information about Entrematic’s I-Class industrial HVLS fan products and features, visit www.entrematicfans.com/industrial, or contact us at 866-349-6108.